The first horse race meeting of the season will take place on Wednesday 24th April 2019. As usual there can be no flying on the Downs on that day. The Derby will be the next race meeting on 31 May/1 June. Welcome to the website of Epsom Downs Model Aircraft Club. 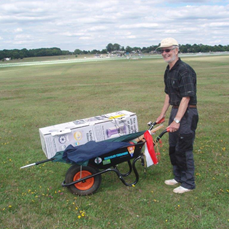 While people have been flying model aircraft on Epsom Downs for many decades, the club has only been in existence for a few years. You can read the background to the formation of the club here. Since the start of 2006 the Epsom Downs Conservators have required that anyone flying a model on Epsom Downs must be a member of this club. This requirement embraces all disciplines of radio control and free flight. Our membership application form can be downloaded from the Membership page. We fly 7 days a week, except for horse race days, from 12 noon until 8pm or sunset - whichever is earlier. Free-flight and non-powered radio-control models may continue flying until sunset when this is later than 8pm. Models over 7kg. and those powered by jet, rocket or gas turbines may not be flown on the Downs. Control line models and catapult-launched models are also not permitted. These restrictions form part of the Byelaws, which along with the Club Rules and Constitution can be found here. Other restrictions also apply - this is just a brief summary of the main ones. See the Byelaws and Club Rules for full details. This website will continue to be updated from time to time with news and information for current and prospective members. The 13th Annual General Meeting of the Epsom Downs Model Aircraft Club was held on Monday 10th Dec 2018 at The Church Hall, Church of the Good Shepherd, Station Approach, Tadworth, KT20 5AH. At the AGM the 2019 membership fees were set to remain unchanged at £10 for senior members, with a £3 reduction for existing members renewing, and free for junior members. The BMFA membership fee for 2019 is £38 for seniors. Personalised renewal letters for 2019 were available for all current members to collect at the AGM on 10th December 2018. Those that were not collected at the AGM were posted to members the following day. The quickest and easiest way to renew is to use your Internet or Telephone Banking service to make your payment direct to our account rather than writing and posting a cheque. Account details are on the renewal letter and you do not need to return the form. In 2018 almost 50% of the membership made their renewal payments this way. Alternatively you can return the signed renewal form with a cheque to the address on the form. The first Saturday in August is the traditional date for the mass launch worldwide of the Cloud Tramp model aircraft. This simple 20" wing span, rubber powered model was designed by the American aeromodeller Charles Grant in 1954, in an effort to attract both young and old to this very worthwhile hobby. Over the years interest has grown and now models are launched all over the world at exactly 17.00 hrs BST meaning that, for example in Australia and many other distant countries the models are launched in the dark or in sport centres. 21 December 2018 Membership form added. Cannot get Epsom location id in module mod_sp_weather. Please also make sure that you have inserted city name.